The popular MTKT seat trays are now available in a vented design. An aggressive look and sporty style give your scooter a new look that still leaves room for other mods, thanks to the vented design. Backlighting really makes the vented openings look the part. 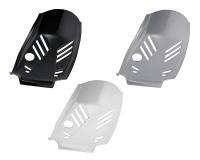 MTKT has developed this seat tray specially for CPI and Keeway models. Some resourceful lads also discovered that, with a few minor mods, this seat tray could also be made to fit Chinese brands such as Longija, Baotian, Mawi, Adly etc. For this reason, we also offer products for those makes, but be aware the modification is required. Available in 3 colours: black, white and grey.